Anoushka Shankar is a British Indian sitar player. She is the daughter of Indian sitar player Ravi Shankar and Sukanya Shankar. She is the paternal half sister of American songwriter and singer Norah Jones. Anoushka Shankar was born in the year 1981 in London and divided her childhood time between London and Delhi. During her teenage years, she lived in Encinitas in California and attended the San Dieguito Academy. She graduated in the year 1999 and decided to pursue a career in music rather than attend further college. Anoushka Shankar is married to British director Joe Wright. The couple had their first child, Zubin Shankar Wright on February 2011. Anoushka Shankar began training with the sitar with her father from her childhood days. She gave her first public performance at the age of thirteen in Siri Fort in New Delhi. She was accompanying her father on his concerts around the four by the age of fourteen. She signed for her first record contract with Angel Records (EMI) at the age of sixteen. Even though success came for her from an early age, she was still uncertain if music was the career she wanted to take up fully. However, she soon realized that she wanted to be a touring musician. Anoushka Shankar released her first album, ‘Anoushka’ in the year 1998 followed by ‘Anourag’ in the year 2000. during the Grammy awards 2003, both Anoushka Shankar and Norah Jones were nominated for Grammy awards and Anoushka became the youngest ever and the first woman nominee in the World Music category for her third album ‘Live at Carnegie Hall’. In the year 2005, Anoushka released her fourth album ‘Rise’ which earned her another Grammy nomination in the Best Contemporary World Music category. On February 2006, Anoushka became the first Indian to play at the Grammy awards. Anoushka Shankar, in collaboration with Karsh Kale also released ‘Breathing Under Water’ on 28th August 2007. This was a mix of classical sitar and electronica beats and melodies. The guest vocals there include Norah Jones, Sting and Ravi Shankar who performed a sitar duet with his daughter Anoushka. Anoushka Shankar has also made many guest appearances on recordings by other artists. These include Sting, Lenny Kravitz and Thievery Corporation. She also made duets with violinist Joshua Bell, in a sitar-cello duet with Mstislav Rostropovich and with flautist Jean-Pierre Rampal playing both the sitar and the piano. Anoushka recently collaborated with Herbie Honcock on his latest record ‘The Imagine Project’. Anoushka Shankar has given soloist performances for her father's 1st Concerto for Sitar and Orchestra worldwide. On January 2009, she was the sitar soloist alongside the Orpheus Chamber Orchestra for the series of concerts premiering her father’s 3rd Concerto for Sitar and Orchestra and in July 2010 she premiered Ravi Shankar’s first symphony for sitar and Orchestra with the London Philharmonic Orchestra in London’s Barbican Hall. Anoushka has also ventured into acting and writing. She has acted in ‘Dance Like a Man’ (2004). She also wrote a biography of her father ‘Bapi: The Love of My Life’ in the year 2002 and has contributed to various books. She also wrote monthly columns for India’s ‘First City Magazine’ for three years and spent one year as a weekly columnist for India’s largest newspaper ‘Hindustan Times’. She released her newest album ‘Traveler’ in autumn 2011 in which is an exploration of the commonalities and differences between classical Indian music and Spanish flamenco and features talents like Shubha Mudgal, Tanmoy Bose, Pepe Habichuela, Sandra Carrasco and Duquende among others. She recorded this album in Madrid in Spain. Anoushka Shankar also performed in a number of benefit concerts. On 29th November 2002, she was the opening act at the Concert for George which is a posthumous tribute to the life and music of George Harrison and was held in Albert Hall in London. She was the principal performer in the entire first set or ‘Indian portion’ of the concert. She opened the show by playing a solo sitar instrument titled ‘Your Eyes’. She also performed George Harrison’s ‘The Inner Light’ with Jeff Lynne on vocals and guitar. in the ending, she conducted a new composition ‘Arpan’ written by her father. The composition featured Eric Clapton playing acoustic guitar. this concert was modeled after Ravi Shankar’s benefit concert with George Harrison ‘The 1971 Concert for Bangladesh’. Anoushka Shankar was also invited by Richard Gere and Philip Glass to perform in the Avery Fisher Hall in a concert in aid of ‘Healing the Divide: A Concert for Peace and Reconciliation’ in the year 2003. in another concert scheduled to be held on 29th November 2008 in Mumbai, Anoushka Shankar and Jethro Tull postponed the concert due to the 2008 Mumbai terror attacks. They reorganized the concert performance as ‘A Billion Hands Concert’ on 5th December 2008 as a benefit performance for the victims of the attack. Anoushka Shankar is a supporter of animal rights and People for the Ethical Treatment of Animals (PETA). she and her father, Ravi Shankar appeared in a thirty second public service announcement against animal suffering. Anoushka is also the spokesperson for the United Nations World Food Programme in India. Anoushka has been deeply rooted in Indian classical music and has been exploring fertile ground in the crossover between Indian music and a variety of genres including flamenco, electronica, jazz and western classical music. 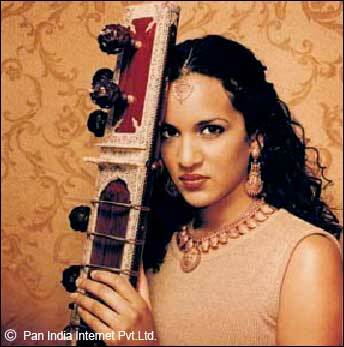 Anoushka Shankar has been awarded the ‘British House of Commons Shield’ in 1998. she was voted Homecoming San Deiguito High School, Class of 1999. she was also named as one of the 20 Asian heroes by the Asia edition of ‘Time’ in the year 2004. she was awarded the ‘Woman of the Year’ on International Women’s Day 2003.